Floor and bathroom tiles and grout can quickly be overtaken with dirt, stains, and mildew. Common residential cleaning systems may remove the stains and mildew, but the cleaning job is labor intensive. It can take hours to clean a small area of the floor, let alone the entire home. 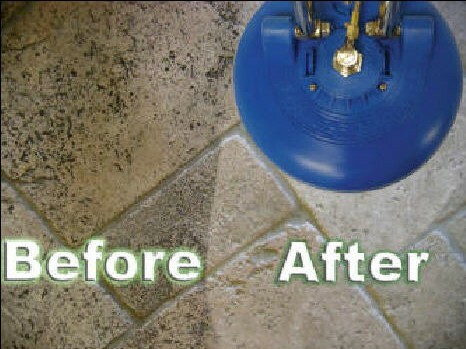 X-Treme Carpet Cleaning offers tile and grout cleaning. At X-Treme Carpet Cleaning, our truck mounted water extraction method utilizes water heated to 200+ degrees to whisk away dirt and grime. Before the final rinsing process all areas are pre-treated with baby and pet safe cleansers then power scrubbed to dissolve and ground-in dirt and grime. High pressure, high heat water extraction then washes away all cleansers, dirt, and grime without leaving behind a sticky residue that will only attract more dirt. Have you ever mopped your tile floor only to see the grout collect even more dirt? Home buckets and mops can cleanse away surface dirt, but grout is a porous, rough surface with all the right characteristics to attract and hold on to dirt. No matter how many times you swipe a mop across the floor, the dirt will stay put in that grout.